Tug boats begin towing Shell Oil's drill ship Kulluk as it is prepared to be loaded onto the Xiang Rui Kou heavy lift transport ship in Captains Bay in Unalaska. The Kulluk, a circular barge with a diameter as long as nearly three basketball courts, broke away from its towing vessel in late December on its way to a shipyard in Washington State. On New Year's Eve it ran aground off a remote Alaska Island near Kodiak Island. It was pulled off six days later but requires repairs. The Kulluk will be loaded onto the heavy lift vessel for transport to a shipyard in Asia. 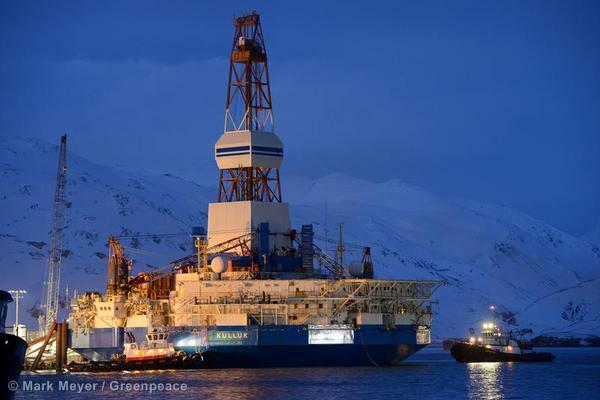 Two winters ago in the treacherous Arctic waters off the north coast of Alaska, Shell’s monstrous drilling rig the Kulluk drifted loose from its towing line and was damaged beyond repair. 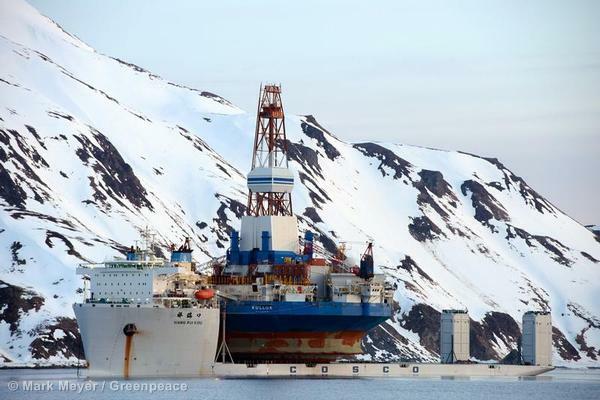 Author and journalist McKenzie Funk published a harrowing tale of Shell’s disastrous incident with the Kulluk last week in the New York Times.Joe Nocera, aTimes columnist and general advocate for oil and gas drilling, followed up with a thorough condemning of Arctic drilling. 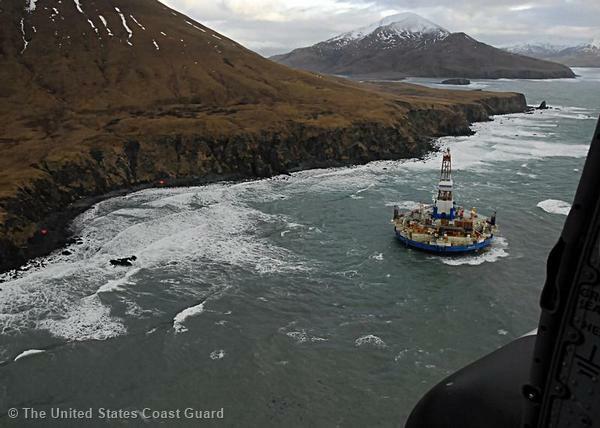 The following photos by Greenpeace and the U.S. Coast Guard document the disaster and the extent of Shell’s attempts to drill in the Arctic since startingtheir Arctic drilling plans. 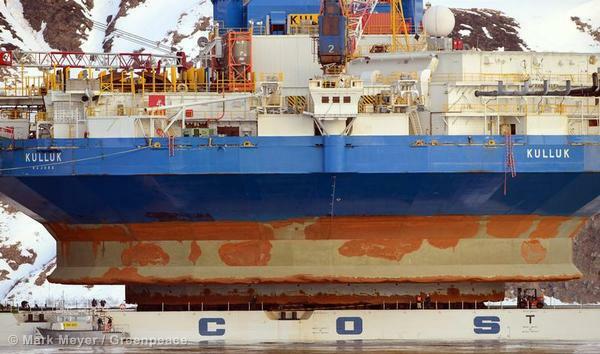 These photos show the power of the Arctic and how its unpredictable conditions can cause catastrophic events, including a 250-foot high steel rig floating uncontrolled and untethered in Arctic waters. 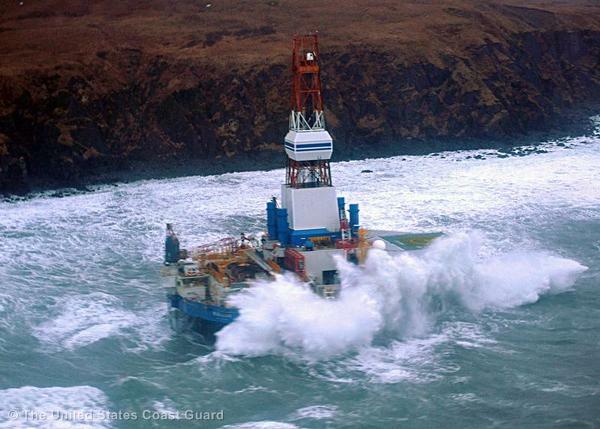 Waves crash over the conical drilling unit Kulluk where it sits aground on the southeast side of Sitkalidak Island, Alaska, January 1, 2013. A Unified Command, consisting of the Coast Guard, federal, state and local partners and industry representatives was established in response to the grounding. Three life rafts (two pictured) sit on the beach adjacent to the conical drilling unit Kulluk, 40 miles southwest of Kodiak City, Thursday, Jan. 3, 2012. The Kulluk grounded after many efforts by tug vessel crews and Coast Guard crews to move the vessel to safe harbor during a winter storm during a tow from Dutch Harbor, Alaska to Everett, Wash. The Shell drill rig Kulluk floats in Kodiak Island’s Kiliuda Bay in Alaska on January 7, 2013 as salvage teams conduct an in-depth assessment of its seaworthiness.The Kulluk was refloated late January 6 and taken to Kiliuda Bay for repairs and a survey. 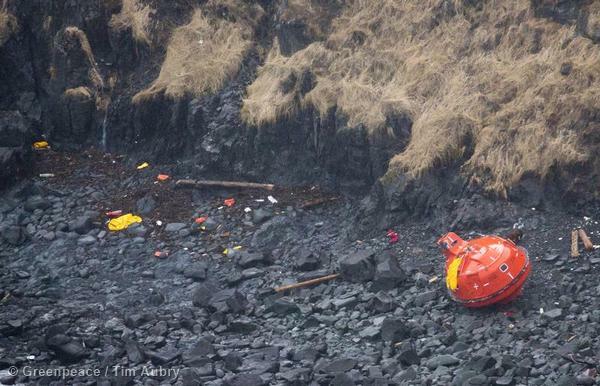 A damaged life boat from the Kulluk and other debris sits on the shore of Sitkalidak Island on January 9, 2013 while salvage teams continue an assessment of Shell’s Kulluk drill barge in Kodiak Island’s Kiliuda Bay in Alaska. 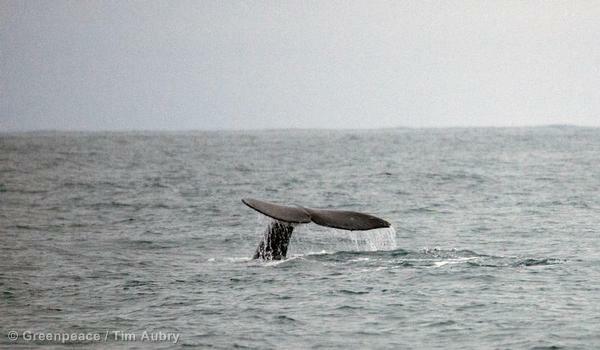 Humpback and California Gray Whales surface near Ugak Island off Narrow Cape in the Gulf of Alaska January 10, 2013. The pod of hundreds of whales were just miles away from where Shell’s Kulluk was grounded December 31, 2012. Month’s after the disaster, theKulluk sits on the Xiang Rui Kou heavy lift transport ship in Captains Bay in Alaska. The Kulluk was to be loaded onto the heavy lift vessel for transport to a shipyard in Asia. …And just so you know how big this thing was, look at the people in the lower left. Seen enough? 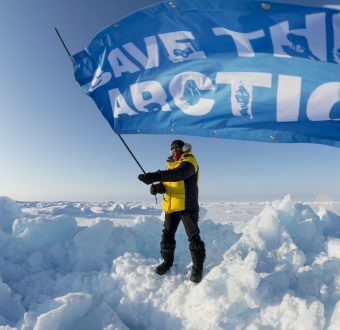 Take action and sign thepetitioncalling on Secretary of State John Kerry to declare anArctic Sanctuary! 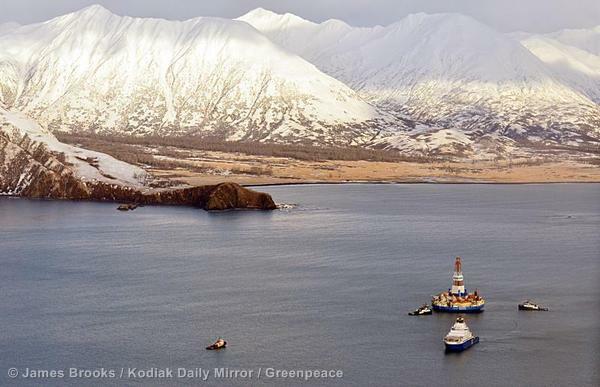 We're taking Arctic oil to court.